We’re working on making our fixer upper a home – one project at a time. I believe in making a beautiful home on a budget, so we can enjoy life with our families in a space that we love. This website has been around since 2010 and we have big plans moving forward! Make sure you’re following along on Instagram & Facebook for all of our renovations in real time! …and because I’m an Amazon Prime mom, basically half of my house is from there 😉 Here’s where you can shop items in our house from Amazon! We bought our first house in 2013 when I was pregnant with our son. It was a cosmetic fixer upper – a 1920’s craftsman twin that we loved! See all of the pictures from that house here. We put in a bid at an auction for a REAL fixer upper when I was pregnant with my second – and we were the only people who bid on the house! It’s a fun story – read all about it here. I’ve chronicled all of our room makeovers here – take a look to see how far this house has come! 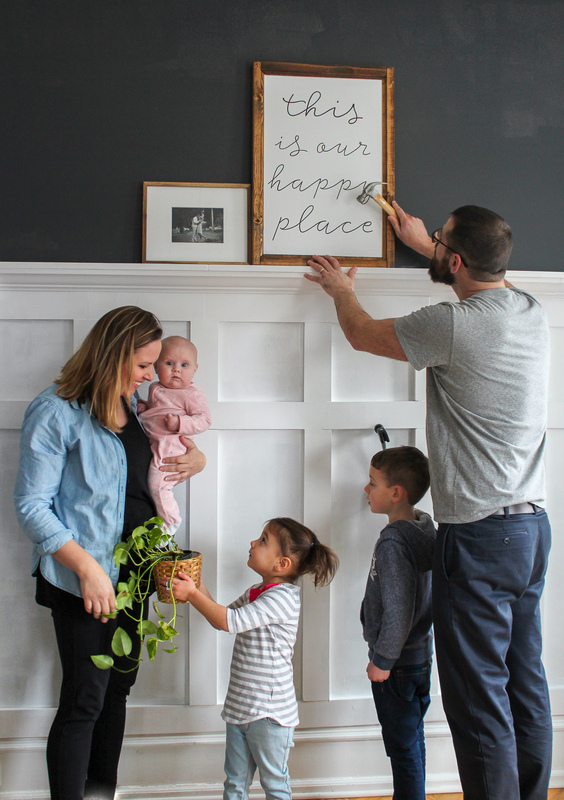 I love taking my readers alongside us as we share our adventures with remodeling a house with three little kids. It’s busy, it’s messy, and it usually never goes as planned! But this isn’t just about us – my passion is to inspire your own adventure! Whether that’s painting a piece of furniture for the first time, getting the courage to tackle your first DIY house project, or even working on remodeling your own home. No project is too big or too small, and all of them are celebrated! Make sure you’re subscribed to my e-mail list for exclusive freebies & announcements – and to get your FREE ebook about how to add character to any home on any budget! I’ve attempted to sign up via the link above but still can’t access the “gather” sign. I’d LOVE to make this. Please let me know what my next steps are. Hi Christina! Did you build your farm door in the entry or did you buy it? I love the hardware on it, very nice. I have been looking for a 42″ round rustic dining table for my combo livingroom dining room with X back chairs.